Tropical North Queensland is a beautiful place to visit and Port Douglas is one of the reasons why. Surrounded by forest and the Coral Sea it is a magical place to visit, especially with the family. 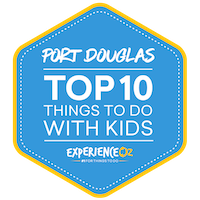 Here, we look at the best attractions in Port Douglas to take your kids! Spend the day cruising, swimming and eating your way around the Great Barrier Reef. Take the 6-hour reef cruise to the Outer Barrier Reef with Australia’s most awarded cruise service – Quicksilver. Jump aboard the high speed catamaran to the renowned Agincourt Reef where you can gaze over the intricate coral formations and colourful marine life and spend the day on the popular activity platform. This trip is the perfect outing for all ages and swimming abilities with activities to suit those who want to jump right in to the ocean and those who prefer to stay dry. The attached activity platform will let you snorkel around the reef or look underwater through a semi-submersible boat with an underwater observatory. "This trip is the perfect outing for all ages and swimming abilities with activities to suit those who want to jump right in to the ocean and those who prefer to stay dry." The friendly crew will also lead a fish feeding presentation – a show not to be missed. Also, marine biologists are on hand to answer any questions and share all of their reef knowledge. For those wanting a little more adventure you can sign up for diving, helmet diving, guided snorkel tours or scenic helicopter rides from the platform. The tour includes morning and afternoon tea and a hot and cold tropical smorgasbord lunch and kids under the age of 4 travel free. Jump on board the popular Port Douglas steam trains for a scenic and historic ride around the town. With a ride on Bally Hooley’s two steam locomotives – Bundy and Speedy – the kids will feel as though they have jumped back in time to when steam trains were at their prime. The steam trains were once used to transport sugar cane from the freshly cut paddocks to the local sugar mill until the mill switched over to diesel. Now instead of making sugar cane runs, they take visitors on scenic routes around the back suburbs of Port Douglas. "With a ride on Bally Hooley’s two steam locomotives – Bundy and Speedy – the kids will feel as though they have jumped back in time to when steam trains were at their prime." Your ride will take you past many different contrasting scenes, including mangroves, golf courses and vibrant marinas. The trains leave the stations every Sunday to ferry families around and show off their beautiful home of Port Douglas. The open air carriages are great for the kids to see all of their surroundings and not miss a thing. The train runs at a slower speed so it is perfectly safe for the younger kids. Port Douglas is the perfect gateway to explore the Cape Tribulation in the Daintree Rainforest and if your children are adventurous then they will love zip lining through the jungle with Jungle Surfing Canopy Tours. While not in Port Douglas, Cape Tribulation is a 2 hour drive away via the cable ferry over the Daintree River and makes for a great day trip out with the kids amongst the wilderness. The Cape Tribulation is where two world heritage listed sites converge and by getting up on the tree platforms, you can zoom through the treetops and see the rainforest from a different perspective flying high with the birds of the rainforest. A guided zipline tour is the best seat in the house to admire the rainforest and the jungle surfing experience will take you through a course of five platforms and six flying fox ziplines through the world’s most ancient rainforest. The height of the platforms range from 7 to 16 metres above ground and you will travel in pairs along the ziplines which is great for any kids (or adults) that are feeling nervous. "A guided zipline tour is the best seat in the house to admire the rainforest and the jungle surfing experience will take you through a course of five platforms and six flying fox ziplines through the world’s most ancient rainforest." The tour begins with a hilarious “Human Hamster Wheel” which will launch you up to the first eco platform to glide through the canopy with 360 degree views of the rainforest and glimpses of the Great Barrier Reef. If you are feeling nervous, then rest assured that you will have the guidance of expert guides who will help you navigate between platform to platform safely. The length of the ziplines gradually increase in length as you make your way through the course from 40 metres to 100m and if you are a dare devil then you can lean back and ride upside down. The 2 hour experience includes 1 hour up in the rainforest canopy with your guide explaining points of interest as you zipline from platform to platform. Jungle Surfing is suitable for children starting from age 3 and with small groups capped at 13, the tour is a far more personal and family friendly experience with time to stop and enjoy the views the rainforest and the reef. Take a guided cruise through the Daintree River to spot some of Australia’s most dangerous animals in their natural habitat. This guided viewing cruise will take you an an hour long journey spotting various animals and plants, and of course, crocodiles! Be sure to have your camera at the ready to capture a shot of one of Australia’s scariest predators. Jump aboard the M.V. Mangrove Jack II for a thrilling and adrenalin pumping tour. The young ones will be so excited to spot their first wild croc with the help of an experienced guide! "There is a 98% chance of spotting multiple crocodiles on the cruise, making for an exciting yet scary tour the kids will love!" There is a 98% chance of spotting multiple crocodiles on the cruise, making for an exciting yet scary tour the kids will love! The experienced guides will be on board to give you facts about the Daintree and the animals that live in it and answer any questions you may have. Everyone on board will be issued binoculars to make spotting those creatures a little easier. Refreshments, snack and beverages are included in the price. The cruise departs seven times a day from 8:15am, 9:30am, 11am, 12pm, 1:30pm, 2:30pm and 4pm. It leaves from a port 30 minutes away from Port Douglas. Jump on the back of one of Ride the Beach Adventures friendly horses and giddy up! In small groups of 8, follow the leader for a gentle ride along the beach and through shallow water. The horse ride is suited to beginner riders with the tour trotting at a gentle pace so you can relax and enjoy the experience and the incredible views. The two hour horse rides will explore the world heritage listed Great Barrier Reef, Daintree Rainforest and Myall Beach by horseback. Your friendly guides will show the ropes and help you to learn the basic skills but if you are a more experienced rider then you are allowed to ride a little bit faster than a walk for a more exciting horse riding adventure. "For those brave enough to saddle up on the big horses, you won’t regret it! Your tour guide will take you on a scenic trail along the coastline showing you all the highlights of the region." See the unique location where the Great Barrier Reef and the Daintree Rainforest collide from the impressive vantage point of horseback. With a variety of horses available, the horse riding experience is open to ages 5 to 105 years old. If riding a grown horse is a little daunting for the young ones they can jump on the back of a pony for a fun little adventure. The pony ride will be an exciting thrill ride for the young ones in a controlled environment with an experienced guide. Each horse has their own temperament, and they are hand-picked to coincide with the confidence of the rider so you're always feeling comfortable! Hands-on experiences with animals are always a favourite activity for children! Wander around the wildlife sanctuary and get a closer look at the luscious rainforest with a trip to The Wildlife Habitat Port Douglas. Visitors are given the chance to dine in the habitat zone, sharing the breakfast table with many different bird species, lunch with some lorikeets and a picnic with parrots. You will be immersed in the wetlands environment while feasting on a delicious tropical breakfast buffet. Share a nibble with a parrot while you take in the huge range of flora and fauna that surrounds you. If you choose to dine for lunch, you’ll be offered a large buffet menu featuring BBQ steaks, salads and homemade soup. You’ll also meet a range of friendly birds from cockatoos and curlews to parrots and herons. "Visitors are given the chance to dine in the habitat zone, sharing the breakfast table with many different bird species, lunch with some lorikeets and a picnic with parrots." Visitors will also have the chance to cuddle up to a koala, feed some kangaroos and get up close to the beautiful rainforest. Watch on as the experienced staff showcase their animals including the koalas, crocodiles and snakes. You’ll also receive guided tours around the habitat, giving you all the information you need to know. If getting a hands on experience with Australian wildlife is on your bucket list, then look no further than The Wildlife Habitat. Watch the kids squeal and squirm as they catch, kiss and release an iconic Queensland cane toad. For the last 15 years, every Wednesday at the Iron Bar in Port Douglas is cane toad racing night. This popular ‘sport’ attracts people far and wide who want to watch from afar or get in on the action. Providing laughs for the whole family, the young ones will love the thrill of racing the cane toads and the fun of picking them up. "Providing laughs for the whole family, the young ones will love the thrill of racing the cane toads and the fun of picking them up." Following a luck of the draw system, those chosen to race are up for a challenge. Racers usually use party blowers to persuade the toad into jumping a certain way. Coaxing and racing the toad is a lot of fun but watching the races is almost more fun – it will be an entertaining night for everyone to enjoy. The race is joined with a comedy show that may have some jokes for the older crowd, but kids are more than welcome to attend, they might even pick the winning toad. We humans aren’t the only ones who like a routine, George the Queensland Groper follows a strict feeding schedule daily. George is fed everyday at 5pm on the dot by his friends at local restaurant, On the Inlet. Weighing in at around 250 kilograms, George can always be counted on for an entertaining dance with his food around dinner time. A local attraction not to be missed, the young ones will be blown away by his size as he flips and twists around his nightly meal. "A local attraction not to be missed, the young ones will be blown away by his size as he flips and twists around his nightly meal." George is regularly spotted in the marina and come 5pm you know where to find him. His favourite meal is a tuna frame and his dinner routine is a must-see as he wriggles and splashes around trying to get the most out of his feast. If you’re in the area in the afternoon a visit to On The Inlet is a must – for their delicious food and resident groper. Holidays can become expensive at the best of times but if you are looking for a low budget activity or place to stay then BIG 4 Glengarry Holiday Parkis a great option for families. The caravan is located a short 10 minute drive from the centre of Port Douglas and provides a quiet retreat from the buzzing village and Four Mile Beach. One of the big draws for families are the kids playgrounds, large bouncing pillows and water park. The water park is a real hit with families all year round with enough small slides, a water splash zone and a small pool to keep the kids entertained and cool in the humid weather for a couple of hours. The water park is surrounded by leafy green shaded areas to retreat to for picnic lunch when everyone wants a take a break from swimming. "The water park is a real hit with families all year round with enough small slides, a water splash zone and a small pool to keep the kids entertained and cool in the humid weather for a couple of hours." Guests will find a heated salt water pool with shallow toddler wading areas and waterfall while the adventure water park has five small slides alongside a children’s playground. Children can also make the most of their day in beautiful surroundings with access to bike hire and pedal go karts at an additional cost. The water park is a great alternative for guests staying at Big 4 Glengarry who don’t need to get into the car and drive to the beach and then try to find a car park. The park has it all here- which is great for families with small children. Make your way down to The Reef Marina and feast your eyes on the string of gorgeous boats docked in the bay. If you make your way down to the marina early in the morning you will be able to wave the boats off as they head out to sea, you might even get a honk from the skipper! There is no better way to start off your day than to get the kids out of bed and down to the marina, the young ones will enjoy waving to the crew men and women and looking at the range of different sized boats. "If you make your way down to the marina early in the morning you will be able to wave the boats off as they head out to sea, you might even get a honk from the skipper!" The beautiful blue ocean and the line up of boats will make for the perfect photograph and the marina is the perfect place to just sit, relax and unwind. You can pack a picnic, bring a frisbee, walk your dog or just relax and watch the boats glide by, there is no wrong way to spend your time at the marina. The Reef Marina is a popular precinct with locals and visitors, with its wide selection of dining options, shopping and entertainment there is guaranteed to be something for everyone. Queensland's Port Douglas isn’t merely a springboard from which to explore all the highlights of the Great Barrier Reef and Daintree Rainforest – it’s also a mature and rather luxurious travel destination in its own right, with a secluded “resort-town” feel that carries with it an air of exclusivity. This is largely reflected in the town’s dining scene, as well, as it boasts a disproportionate amount of high quality restaurants and other eateries relative to its small size – those looking for a quality meal during their visit to Port Douglas will be spoiled for choice here. There’s over 60 restaurants and cafes in total on offer, all of varying budget levels and with differing outlooks, with the majority situated around the hub of Macrossan Street and others sprinkled throughout the region. Renowned for incorporating seafood with a dash of tropical influence, but also covering a range of cuisines, Port Douglas‘ restaurants are varied enough to make for a new and refreshing dining experience each night, with the overall vibe being “upmarket casual”. If you're looking for a range of quality dining options, we take a look at 10 of the best restaurants in Port Douglas in detail below. One of the more atmospheric dining venues available in Port Douglas, Watergate is another restaurant in the heart of Macrossan Street albeit with a notable difference. The venue is a hybrid bar/restaurant that excels in both regards, however it’s the lovely indoor and outdoor setting that trends towards the romantic and intimate that helps set it apart. Watergate offers a tropical dining experience nestled amongst greenery and under the cover of canopies, all lit by fire torches and candlelight that creates extra immersion and emanates “rainforest dining” in every sense of the term. The restaurant has a definite fine dining aura about it, with decor that has a slight hint of Asian fusion about it (reflective of the menu, as well), with darker furniture throughout that helps create a nicely subdued feel despite its central location. Menu-wise the offerings are Modern Australian but with the aforementioned slightly Asian-influenced twist, and features a nice and varied choice in dishes balanced between fish and meat selections. Tasting plates are a great way to start your dining experience at Watergate, with their included scallops particularly delicious, while mains are likewise well prepared and incorporate local fish and other ingredients to the fullest. "The venue is a hybrid bar/restaurant that excels in both regards, however it’s the romantic and intimate setting that helps set it apart." Crocodile, kangaroo and steak are all menu staples as well with eye fillet a melt-in-your-mouth standout, and both kitchen and waitstaff are very willing to cater to and make exceptions for any specific dietary requirements. Service is upbeat and friendly, and the motto at Watergate seems to be “water always full, wine never empty” – priority is put on attentiveness here, and it shows. Staff are genuinely welcoming here as well, and their warmth feels like a true thing rather than merely a facade put on as part of the job, and nothing ever seems to be too much trouble to request. Watergate’s proprietors are always happy for people to simply stop in for a drink rather than requiring only full-blown meals, as well, and if you’re in Port Douglas and looking for an elegant spot to enjoy a creative cocktail, it’s a solid choice of venues. Cocktails (and mocktails for the young ones and non-drinkers) are inventive and represent a fantastic level of choice, with prices reasonable. Watergate is slightly hidden compared to other restaurants nearby – look for its torchlit path as a sign of entrance – but be sure to seek it out for a great and immersive dining experience. One of the newest entrants to the Port Douglas dining and drinks scene, Barbados has provided the much-needed filling of a gap that existed for a modern waterfront drinks venue. Perched overlooking the waters of Dickson Inlet, Barbados is a contemporary and sleek offering that serves as a great place to unwind after a day out exploring the wonders of the Great Barrier Reef; simply stroll along from the marina and you’ll find its stylishly designed lounge-bar awaiting. Barbados is oriented around providing its guests with a relaxed venue in which to unwind and enjoy the views of both sunset and water traffic passing by, with its decor and furniture examples of ultramodern class. The venue provides comfortable seating in the form of both couches and daybeds as well as a regular seats, and as a result serves as an excellent new spot for a drink and light dinner combination, or as a pre-dinner venue for some more in-depth dining in the centre of town later on. "A go-to destination for those looking to relax, Barbados is on the right track to becoming a staple in the Port Douglas relaxed dining scene." The bar offers a small and reasonably-priced menu that serves the likes of pizza and nibbles, bread and dips along with antipasto platters rather than full-flung mains, with a favoured options being enjoying a generous portion of prawns while gawking at the action happening on the adjacent waters. Enjoying a drink is undoubtedly the main focus at Barbados, however, and its bar offers a huge selection of cocktails to choose from which – while fairly pricey – are massive in size and thus last quite long to justify the investment. Many of the cocktails have a number of added spices which provide some extra “kick” to standard flavours, while other more conventional spirits can be found in abundance. Barbados is crewed by a great staff who are obviously putting in maximum effort to help get its reputation established, and it shows; while there’s also a high level of involvement from the owner offering personal attention wherever possible which is a nice touch. A go-to destination for those looking to relax, Barbados is on the right track to becoming a staple in the Port Douglas relaxed dining scene. Spanish cuisine and tapas style dining go hand-in-hand, and Port Douglas’ premier answer to this tendency is the excellent Seabean, another foodie staple with a great outlook and plenty of talent in cooking to help it stand out. Seabean is situated immediately opposite Port Douglas’ marina and has a pleasant open-air aspect which makes for a welcomingly refreshing sea breeze during hotter periods, with both indoor and outdoor seating that’s all sufficiently undercover in case of the occasional downpour. Specialising in a wide range of delicious tapas, Seabean’s dishes are considerably larger than most share plates found around the country. The tapas on offer is great for meat lovers and vegetarians – not to mention seafood fans – alike, with the calamari in particular wonderfully tender and the pork and chorizo offerings likewise delicious. Perhaps the best thing about a tapas-oriented menu is the level of flexibility it provides in terms of both volume of food and budget, and as a result Seabean is one of the best options in town for when you’re merely “a bit peckish” or watching the wallet. "Specialising in a wide range of delicious tapas, Seabean’s dishes are considerably larger than most share plates found around the country." Mains are also on offer, of course, and as with many other Port Douglas restaurants the emphasis leans towards seafood, which is likewise great here. Mussels, soft-shelled prawns and scallops are as fresh as one might expect, while the signature Paella makes use of all of the above to form a wonderful and characteristically Spanish dish. Desserts are inventive and well presented as well, with the standout being the creme brulee which is served in a half-coconut; it’s a wonderfully original spin on a standard formulae and nicely reflective of the tropics. Of course, keeping things conventional you can opt for another Spanish staple – the churros. Staff involvement here is another plus point in Seabean’s favour, with waitstaff highly familiar with the meals and always willing to help with both recommendations as well as beverage couplings. No Spanish meal is complete without enjoying a sip of Sangria, of course, and when tasted chilled here it’s highly refreshing. Add in plenty of excellent gluten-free options on the menu for those with dietary issues and a high level of involvement from the proprietor and you’ve got a great mix of the exotic and the tropical all in one. If absolute beachfront dining is something that ranks high on your atmospheric wants list while in Port Douglas, the 4 Mile Beach-adjacent Hi Tide certainly fits the bill. It’s a great starting point for new arrivals to the region who are wanting a “taste of the tropics” both from a scenery and culinary point of view, and makes for a quality meal for all of breakfast, lunch and dinner. Nestled in a quiet and picturesque street, Hi Tide serves as a great way to start the day or end an evening due to its propensity for some quality alfresco dining via some comfortable outdoor seating from which to take in the neighbouring panorama. Hi Tide is very well-priced considering it offers one of the best view/dining combinations in Port Douglas. Its proximity to a number of popular accommodations makes it a go-to option for those staying in the vicinity – particularly those who are fans of coffee. This is one of Port Douglas’ best spots for quality coffee both in its hot and iced forms, which serves as a great complement to some of the tasty breakfast dishes, such as the cauliflower fritters and eggs Benedict which serve as highlights. "Hi Tide is very well-priced considering it offers one of the best view/dining combinations in Port Douglas. Its proximity to a number of popular accommodations makes it a go-to option for those staying in the vicinity – particularly those who are fans of coffee." The menus at Hi Tide are not wide, however portion sizes are ample and the dishes are done delightfully to compensate, and for those visiting during the evening there’s a special option that can be chosen. The restaurant offers a range of tapas as a stop-gap in the interim between lunch and dinner, which makes for an ideal light meal in a pinch. Once dinner proper rolls around, the choice opens up even more as a solid wine selection couples with hearty mains and excellent seafood highlighted by top-notch barramundi. Fast and friendly service round out the Hi Tide dining experience, with waitstaff largely possessing of outgoing, friendly personalities and willing to accommodate requests. If you’ve had mental imagery of relaxing by the water and enjoying a bracing sea breeze in your mind prior to visiting Port Douglas, there are few spots that embody this enjoyable cliche as well as Hi Tide does. An upscale restaurant offering a great mix of Aussie-style fare, Salsa is a lively, busy restaurant that’s been a long-running fixture of the Port Douglas dining scene for decades and is always buzzing with both locals and visitors from afar alike. Situated just across from ANZAC Park in central Port Douglas and offering great views from its tables with the opportunity to dine while soaking in a glowing Tropical North QLD sunset, Salsa scores additional points for ambience – the restaurant boasts a relaxed atmosphere that contrasts with the high standard of food to be enjoyed within. Salsa specialises in putting an original spin on popular dishes, and originality plays a key role within the dining on offer here; an innovative use of local produce with dashes of local flare thrown in make for a refreshing menu that’s both extensive and full of surprises. Key examples are some of the menu’s highlight dishes that may be unusual for some but serve as a great sample of the Port Douglas region as a whole, such as duck given a tropical twist courtesy of a delightful paw paw relish, or sausages made from crocodile meat, among countless others. "Elegant yet buzzing with a humble and unpretentious vibe, Salsa will not disappoint diners of all dispositions." Dishes at Salsa are beautifully presented with obvious pride taken in their preparation, and while it’s not a cheap dining option, the restaurant is very reasonably-priced given its combination of quality dishes and prime location. For the more budget-conscious diner, specials are available – detailed by the staff upon arrival – that can help keep costs down without compromising on meal quality, as well. The interior of Salsa emanates warmth, with liberal use of wood and colours that bring to mind a slightly “nautical” theme, and this warmth is reflected in the attitudes of its staff as well. Service here is courteous and friendly while being hard to fault in terms of speed – particularly given the restaurant’s eternal popularity. This popularity makes prior bookings a must, but its location just a stone’s throw away from the beach and within easy access of most Port Douglas accommodation makes it easy to access for those looking to dine later. Elegant yet buzzing with a humble and unpretentious vibe, Salsa will not disappoint diners of all dispositions. This classy and upmarket restaurant situated at the top end of Macrossan Street mixes together the best of classic Italian dishes with the fresh produce of the Port Douglas region to wonderful effect. Sassi’s menu specialises in fresh seafood dishes cooked to perfection, however a visit here doesn’t solely require a love of all-things-fishy, as the restaurant’s steaks in particular are also wonderfully prepared as well as massive in size. The restaurant’s location grants its customers some nice views over both park and ocean, too, and its overall ambience is one of class and true caring for its patrons from start to finish. The menu consists of authentic Italian dishes – particularly pastas, as is to be expected – and each of which is packed full of both flavour and ingredients without skimping on the seafood or meat content within. Meals here are well plated, and offer a number of excellent variations from which to choose; the linguini marinara, for example, is so densely packed with seafood as opposed to the “fill it with pasta and throw a few prawns in” that many other restaurants take as to be highly refreshing. Other highlights include the Spanner Crab fettucini (meaty and fulfilling), and even some of the entrees and tapas – particularly the zuchini fritters which are great for sharing – are standouts in their own right. "This classy and upmarket restaurant situated at the top end of Macrossan Street mixes together the best of classic Italian dishes with the fresh produce of the Port Douglas region to wonderful effect." Desserts here warrant a special mention as well, as Sassi’s final courses all have their own flare. A basil gelato with prunes and figs is highly original to the average Aussie diner and presents an interesting encounter for the palata, while the nougat tiramisu is perhaps the main highlight of the restaurant’s dessert menu. Those looking to enjoy a drink will find much to like at Sassi, as well, as cocktails here are largely delicious with a number of creative concoctions to tantalise the tastebuds, while the excellent and reasonably-priced wine list offers a number of top drops available by the glass. Sassi is crewed by a mostly Italian staff which helps add an extra layer of authenticity to the proceedings, and a friendly and jovial attitude throughout the dining experience with the occasional bout of banter thrown in is very welcome. Menu items are also patiently and descriptively explained without ever feeling condescending. Lastly, the setting caps things off – its outdoor dining area is secluded in tropical greenery giving the restaurant an immersive and slightly escapist feel despite its central location. For quality Italian food in Port Douglas, Sassi shines. For those looking for a big-city quality dining experience in what is a regional destination, Harrison’s will likely fulfil your desires, and then some. Located on the Port Douglas waterfront at the Sheraton Mirage hotel, the restaurant offers glimpses of the ocean and resort pool before light fades, and presents a refined and relaxed atmosphere that serves to set the scene for the meals on offer within. In terms of presentation and raw quality of ingredients, Harrison’s may be the top of all restaurants in Port Douglas, with the only barrier to some being the price – a necessity given the standard and skill put into their preparation. Harrisons offers diners a wonderful selection of items on its various menus, with the “pickings” options a wonderful way to start and a great overall choice for getting a sampling of some of the bold and diverse tastes to come; the sesame prawn toast is a surprisingly delicious highlight for what is typically a basic starter, for example. Meals on offer here are an exercise in inventive use of ingredient combinations for sauce and topping production that produces some inspiring and strong flavours; mixtures of the likes of raisins, ginger, sweet and sour radish and a number of other garnishes make for some true taste sensations. "If you’re looking to spend a little extra, Harrison’s makes for one of Port Douglas’ most unique and memorable dining experiences." Presentation of the dishes is a true standout, as they’re as visually appealing as they are to taste, with appearances obviously given priority by the talented cook staff. For those looking to indulge, the degustation menu encompasses a wonderful cross section of flavours that’s enjoyable across the board, from Amuse Buche at the start to delectable Treacle Tart at the end. In all, Harrison’s boasts a contemporary menu with added little surprises in every dish; your mouth will most certainly never be bored while dining here. Service here is highly attentive and water glasses are seldom left half full, while its beautiful and quiet setting with a sophisticated design that incorporates fairy lighting, white curtains and a number of other elegant touches help set Harrison’s apart from similar dining offerings in the vicinity. If you’re looking to “splash out” and don’t mind loosening the pursestrings, Harrison’s makes for one of Port Douglas’ most unique and memorable dining experiences. There’s a lot to be said for the role location plays in enhancing a dining experience, and in this sense On the Inlet is hard to beat; living up to its name, the restaurant sits right on the waterline of Dickson Inlet and grants diners with wonderful views out onto the Coral Sea and other natural surrounds. It’s hard to argue with On the Inlet being Port Douglas’ best-positioned restaurant, so if the romance of a lovely aspect is a major drawcard for a dining experience, it makes for a choice of venues that’s hard to beat. It’s a picturesque locale, to be sure, and befitting its seaside orientation comes a menu that is brimming with some of the best seafood dishes to be had in the Port Douglas region. The freshness of the seafood at On the Inlet is one of its key calling hards, and a factor which makes even basic menu items such as ordering a bucket of chilled prawns coupled with a beer a delight to enjoy. Of course, the menu contains much more advanced offerings than this, and has been intentionally limited in order to focus on mastering quality of available dishes as opposed to opting for sheer quantity. Assuming you’re a seafood fan, you’ll be in your element here as there are a number of delectable standouts that take advantage of the adjacent sea’s bounty to the fullest; Sashimi here is particularly enjoyable, while the whole crab served with a garlic-chilli sauce is delectable and the expansive seafood-platter-for-two represents a good value for money proposition for couples in particular. "Dine on the water, watch the sunset, and enjoy wonderful seafood – the mixture of which makes it one of Port Douglas’ most romantic dining options." Venue-wise, On the Inlet is laid out in order to capitalise upon its views, and while not everyone can get an immediate-waterfront seat (particularly around sunset when crowds are at their peak), there’s a pleasant outlook available from within all parts of the restaurant. Fans are used throughout in order to help disperse the heat, and outside of the peak of summer provide adequate enough cooling, while the decor is low-key and unpretentious while still in good condition and stylish. On the Inlet is also the site of something of a local highlight – the feeding of a resident, massive Groper affectionately named “George” that regularly graces the waters with his enormous 250kg presence. Feeding George is done at 5pm when he deigns to show up, and offers an additional layer of fun for the kids. On the Inlet has multiple levels of appeal to go around – dine on the water, watch the sunset, and enjoy wonderful seafood – the mixture of which makes it one of Port Douglas’ most romantic dining options. Situated at the top end of Macrossan Street in the heart of Port Douglas, 2Fish - as one might guess from its name - specialises in seafood yet offers enough standouts in other areas (particularly desserts) to make for an experience all of its own. Set within a pleasantly open and "beachy" setting with an open kitchen that helps add to the atmosphere, this is a modern and upmarket feeling venue that still retains a comfortable casual air without being pretentious. As a result, it's a highly viable venue for both lunch and dinner for those willing to spend a little more in return for some truly quality food. 2Fish's mixture of fine-dining-quality food and casual atmosphere combine with its great cross-section of local seafood and produce on the menu to make for an easy to recommend go-to for fans of seafood in particular. While it's on the upper-end of the pricing scale, it's very much a matter of "getting what you pay for" here, with its full barramundi in particular perhaps the standout in what is overall a quality menu. This imaginative menu - which also features other highlights such as tuna tataki, calamari salad that's incredibly tender, Moreton Bay bugs and King Salmon - couples with a diverse and well-balanced wine list to make pairings of all kinds enjoyable. For those having trouble deciding, or wanting to sample a cross-section of the flavours on offer, the fish degustation menu provides an amazing platform to do so. "This is a modern and upmarket feeling venue that still retains a comfortable casual air without being pretentious." This 5-course ensemble of flavours provides an excellent sampling of regional seafood complete with matching wines, and makes for an ideal "special occasion" dining option in Port Douglas. Those looking to enjoy a meal here slightly on the cheaper can swing by during the afternoon special period between 2 and 4pm for a quality bite at a reduced price, too. Presentation of all dishes at 2Fish is universally great (particularly the imaginative dessert layouts), while cookstaff are also typically happy to adjust existing meals to cater for those with allergies or other dietary requirements. Service here is typically friendly and prompt, with enthusiasm often making up for a lack of experience. Due to its popularity, the restaurant is typically also very busy, making prior bookings for those looking to enjoy dinner here strongly recommended. Great cocktails round out 2Fish's offerings, while its immediate roadside location makes it both easy to find and a pleasant venue for people-watching while enjoying a top-notch meal. Offering high class food at a reasonable price, Zinc is another Modern Australian offering that ranks amongst the upper-echelon of such restaurants in Port Douglas. Boasting a pleasant ambience courtesy of its open-air, white-terraced layout that blends together a combined main restaurant area with a hybrid bar/lounge section, Zinc mixes the best elements of all of these into a single, pleasant venue. What helps make Zinc stand out among some of its peers is its balance between cost, atmosphere, service and meal sizes while offering food that carries on the trend of improvising with TNQ spins on what might otherwise be standard dish formulae. A visit here can be done as a casual, passing-by affair to enjoy a drink – simply order at the lounge and relax on the comfortable couches as staff bring the drinks to you (a nice touch), including a great selection of beers on tap. Alternatively, dine here as a full-blown dining affair of enjoying dishes that rank amongst the best on offer in town and you likewise won’t be disappointed. Meals at Zinc are well-portioned, and there are a number of great standouts on the menu – including the kangaroo salad, prawn pasta, goat’s cheese soufflé and salmon-and-polenta-mash – that showcase both creativity and an expertise in preparation. "Zinc mixes the best elements of restaurants and relaxed bar into a single, pleasant venue." Zinc’s layout consists of a decor that presents as fine dining, with a number of nice and upmarket-feeling touches throughout, highlighted by its great fish tank/aquarium which adds additional ambience – a factor that makes even a visit to the toilets and enjoyable prospect. Likewise, the restaurant’s combination both air conditioning and a liberal use of fans means that even dining outdoors retains a cool environment. Zinc offers both indoor and outdoor dining, with the outdoor area well-covered in the event of a characteristic Tropical QLD downpour. Service here is likewise exceptional, with staff friendly and conversational without being intrusive or overbearing, and they’re always willing to recommend other local spots – such as bars or other after-hours venues – to pay a visit to following a meal. Lastly, one of its best value propositions for families comes courtesy of Zinc’s “Kids Dine Free” feature that entitles kids to one free meal from the kids’ menu for every full-sized main ordered – a wonderful touch. QLD's Port Douglas is perhaps the Great Barrier Reef's most exclusive holiday destination, boasting an up-market atmosphere and additional feeling of seclusion that helps to separate it from its nearby bigger brother, Cairns. Located in an idyllic position amongst the triad of natural attractions that are the Daintree Rainforest, Cape Tribulation and the reef itself that's all augmented wonderfully by tropical weather, Port Douglas offers a true “getaway” in every sense of the word. While it's generally pricier than Cairns and other similar alternatives, Port Douglas' magnificent surroundings and laid-back nature make this extra investment more than worth it; if Cairns is one of Australia's best places to visit in your 20's, then Port Douglas is the oasis of choice for those 30 and over. In addition to pure relaxation, Port Douglas offers a myriad of activities and attractions within easy reach of its main hub including both the nature-oriented and man-made. But what are the absolute must-do experiences while you're here? 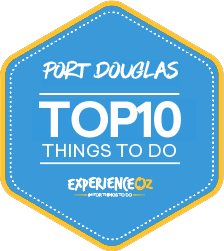 We break down our list of the Top 10 Things to do in Port Douglas in detail here to ensure you get the best out of your visit to the Tropical North. While snorkelling is all well and good to get an initial sampling of the wonders the Great Barrier Reef has to offer, it's hard to dispute that those who want the most immersive and complete experience available are going to have to go the extra mile, suit up, and embark on a diving trip. It's only fitting, then, that Port Douglas serves as one of the most popular departure points for dive spots in the country – the reefs located closer to Port Douglas are generally slightly less damaged than those closer to Cairns due to a lesser degree of overuse, and allow divers to see unfettered marine life at its absolute best. Port Douglas also benefits by being physically closer to the “true” Outer Great Barrier Reef than Cairns is, which can make for a slightly shorter trip out. While there are many quality operators who service the Great Barrier Reef as a whole, your choice of who to go with will likely depend on which particular reef you're interested in diving and how confident you are in deeper water; however, the two most popular individual reefs accessible from Port Douglas tend to be Opal Reef and Agincourt Reef – with each offering something slightly different. Opal Reef, which is differently-shaped and offers more sheltered conditions is perhaps the better choice for novices and beginners. "The reefs located closer to Port Douglas are generally slightly less damaged than those closer to Cairns due to a lesser degree of overuse, and allow divers to see unfettered marine life at its absolute best." Due to its size, only smaller vessels are allowed to visit here, which in turn means both less people in the water overall and thus less of a rowdy and undisturbed atmosphere in the water; this also helps with a greater degree of personal attention and guidance to some extent. Operator Calypso Cruises comes highly recommended in this regard, with renowned good service, modern and well-equipped “smaller” (relative) vessels that that guests on tours to visit three separate dive sites around Opal Reef and each comes with generally excellent visibility. The trip out with Calypso takes around 90 minutes from Port Douglas and is a good choice for nervous first-time introductory divers. Heading to Agincourt Reef with Quicksilver Cruises, meanwhile, is quite a different experience as they're a larger, extremely efficient and streamlined operation that specialises in augmenting their dive trips with additional activities both in and out of the water for guests to take part in. Trips with Quicksilver are based on floating activity platforms moored at the reef, and this comes in particularly handy if you're the type – or are travelling with someone who is – a non-swimmer, as they'll have greater opportunities to enjoy themselves by taking part in the likes of glass-bottom observatory viewing, semi-submersible trips and even just he simple confidence boost of being able to enjoy the water immediately surrounding the platforms themselves. Likewise, this comes with the bonus of a full array of facilities on-board such as showers, bars, plenty of seating and more, so it's a comprehensive and balanced experience if slightly more touristy. In terms of reef structure, Agincourt differs to Opal in that it's a large ribbon reef that offers a slightly more diverse array of coral and fish varieties. Due to its exposed nature, Agincourt is also thus slightly more conducive to diving rather than snorkelling, and its various drifts and walls have plenty of isolated pinnacles teeming with varieties of pelagic fish and vibrant gardens of coral; expect to encounter massive wrasses and groupers mixed in with clownfish (Hi, Nemo! ), anemones and much more. If you're still having difficulty deciding, the general rule is this: Opal Reef for beginners and those looking to mix in some snorkelling, and Agincourt Reef for more experienced divers and those travelling with non-swimmers who want more to do out of the water. Regardless of your choice, diving the reef at either of these spots is the quintessential Port Douglas experience and thus hard to dispute as the top thing to do in the region. Port Douglas and the greater Tropical North QLD region in general are blessed to have not one, but two incredible natural wonders on their proverbial doorstep, and while the Great Barrier Reef often receives the majority of the attention on the global stage, don't sleep on the Daintree in terms of impressiveness – it's incredible in its own right. Featuring a diverse ecosystem and some of the oldest preserved plant life on the planet, the Daintree is home to over 3000 species of plants and contains 395 species that are listed as either rare of threatened, making for a delicate balance of organisms that have existed in harmony since time immemorial. While it's possible to drive yourself, planning and getting to all of its highlights in a comprehensive itinerary can be quite a chore, and that's where tours come in. Exploring the Daintree is thus a wonderful adventure, and The Adventure Company offer trips with pickups from Port Douglas that will take you on a journey into its heart. Getting to the most popular entry points for exploring the Daintree (in particular, the section near to highlights such as Mossman Gorge) from Port Douglas takes roughly 1.5 hours via drive along some incredibly scenic coastal road on the Cook Highway. Upon arriving, you're then able to make your way deeper into the rainforest, when the real journey commences with a walkabout amongst the lush surroundings. Guides will provide detailed commentary during the walk on various plant and animal life encountered while absorbing all the scenery and rainforest landscapes. Sights such as wild mangroves, massive ferns and, of course, the towering canopy above are breathtaking for their vibrance and akin to stepping back in time a few million years. Continuing on down to Mossman Gorge – a great spot for a cool-down swim during the warmer months – is another highlight, and there are plenty of opportunities for grabbing some great photos and getting an overall view at the expanse of the rainforest. "While the Great Barrier Reef often receives the majority of the attention on the global stage, don't sleep on the Daintree in terms of impressiveness – it's incredible in its own right." Pressing onwards, the journey reaches the cable ferry crossing at the Daintree River. Vehicles are taken across via the ferry and then able to travel further ahead to what for many its one of the major highlights of the greater Port Douglas region – Cape Tribulation. Perhaps one of the most impressive panoramas available in Tropical North QLD, this is the exact point where the “rainforest meets reef” promotional spiel truly comes to fruition; it's still a relatively untouched region and the sheer vibrance of the water/sand/rainforest combination clashing against one another is remarkable. Cape Tribulation's iconic boardwalk is a staple of postcards and calendars Australia-wide and a living promotional tool to the beauty of Tropical North QLD in a nutshell – the walk provides a truly dramatic lookout point. Couple this with a walk on Cape Tribulation Beach and you've got a quintessential experience of this region all included as part of the tour itinerary. Capping off the journey is a boat trip down the waters of the Daintree River with a key focus on wildlife spotting and watching, and it's a true treat to see ancient reptiles such as crocodiles and snakes in their natural environment. As Cape Tribulation is the veritable “end of the road”, and the tour is very much a full-day affair, many take the option of booking a night in Cape Tribulation village to recharge their batteries before returning refreshed the next day. If you're making the effort to travel to Port Douglas, don't let the reef overwhelm your schedule without sparing time for the Daintree- neither are any less essential "bucket list" items than the other. A favourite of families and wildlife lovers in general, Port Douglas' Wildlife Habitat is a great, reasonably-priced showcase of the diversity of Aussie animal life with some of its own interesting quirks and offerings to set it apart from other standard zoos in the big cities. Featuring a huge and diverse range of flora and fauna, the facility offers the chance to truly get very close to a wide range of birds and other animal life; it puts a real emphasis on getting “hands-on” with the animals and encouraging interactivity that is always a hit with the kids and visitors from abroad in particular. All your essential Aussie wildlife staples are covered here – standards such as kangaroos, koalas and snakes are interspersed with other species that are more representative of Tropical QLD. The crocodiles in particular are a highlight as many of them are huge and watching them being fed is quite a thrill, while other varieties of animals like cassowaries, pythons and tree kangaroos are all living reminders of Australia's natural diversity. One major point in the Wildlife Habitat's favour is that the animals on offer are given quite a large degree of freedom; their enclosures are far more open than your average zoo, and it's all designed with a natural and organic layout that helps to maintain its feeling of immersion in the rainforest surrounds. "The Wildlife Habitat puts a real emphasis on getting “hands-on” with the animals and encouraging interactivity that is always a hit with the kids and visitors from abroad in particular." Feeding, patting, and otherwise interacting with the animals is encouraged, while regular talks and presentation by the friendly staff are held at regular intervals throughout the day with highlights such as reptile presentations and croc feeding highlights. It's also obvious that the animals are all happy and well cared for, which goes a long way in this kind of facility. Optional additions available to the standard Wildlife Habitat entry include the Breakfast with the Birds – which provides a tasty meal as birds wander freely amongst the guests and provide a tableau of natural noise and colour that's exceptionally lively – and the Lunch with the Lorrikeets featuring a barbecue and the rainbow-coloured “Lorries” with a range of bird friends. It's a truly immersive and wonderful experience that expands the habitat into the realm of humans. Feeding, patting, and otherwise interacting with the animals is encouraged, while regular talks and presentation by the friendly staff are held at regular intervals throughout the day with highlights such as reptile presentations and croc feeding highlights. It's also obvious that the animals are all happy and well cared for, which goes a long way in this kind of facility. Optional additions available to the standard Wildlife Habitat entry include the Breakfast with the Birds – which provides a tasty meal as birds wander freely amongst the guests and provide a tableau of natural noise and colour that's exceptionally lively – and the Lunch with the Lorrikeets featuring a barbecue and the rainbow-coloured “Lorries” with a range of bird friends. Lastly, price is one of the main factors in making the Wildlife Habitat so highly recommended; not only is it a quality attraction, but the standard entry price of $33 per adult and $16.50 for kids is incredibly reasonable, particularly given the comparable prices of other zoos throughout the country. Expanding the experience to the optional Breakfast with the birds or Lunch with the Lorikeets does increase the price slightly, but given you're getting a meal and some interactive animal entertainment along with it, it's still great value for money. A slower, extended and more leisurely Reef experience that still provides the benefits of ease of access is desirable for many, and the nearby nature of the aforementioned Low Isles present the opportunity for a leisurely, stress-free visit exemplified by operator Sailaway's – you guessed it – sailing trips. Given the relatively smooth waters between Port Douglas and the Low Isles as well as the quieter, wind-propelled nature of a sailing vessel, it's a combination that makes for a trip of peace and serenity while still getting to take part in all the essential reef activities such as snorkelling, glass-bottom boat trips and the simple enjoyment of strolling on pristine white beaches amongst the palm trees. This feeling of solitude is also carried over in the offered itinerary times – trips departing in the morning or later in the afternoon mean that you'll avoid the busiest times on the Low Isles as most other tours will either be just arriving or packing up to leave by the time you arrive. Cruises are conducted aboard lovely, decked-out sailing catamaran that has all the mod-cons one would expect of larger vessels, and tour group numbers are purposefully kept low in order to maintain a less busy atmosphere throughout. "Given the relatively smooth waters between Port Douglas and the Low Isles as well as the quieter, wind-propelled nature of a sailing vessel, it's a combination that makes for a trip of peace and serenity." During the course of the tour you'll get to enjoy a variety of inclusions such as morning / afternoon tea, fruit platters and a delicious buffet seafood lunch as well as all the equipment you'll need to enjoy both the beach and the water. Once arriving at the Isles you'll have them basically to yourselves other than your fellow travellers, and then be able to take part in your choice of two guided snorkelling tours – one beginner, another more advanced – and head straight into the highly accessible water for some reef exploration just off the island. Plentiful soft corals, clams, turtles and, of course, fish can be found immediately off shore, and those who would prefer to avoid getting wet can instead choose to laze in the sunshine and then take part in one of the offered glass bottom boat tours that provide not only great views but a guided, interpretive commentary on the reef as a whole. While both the morning and afternoon itineraries have their benefits, our recommendation is the afternoon tour as you'll have the chance to take in some gorgeous Tropical North QLD sunsets from the boat while enjoying a glass or three of wine, which is what tropical island getaway relaxation is all about. The rest of the activities on this list not quite adventurous enough for you? Not to worry – while Port Douglas might not have the reputation for adrenaline that Cairns does, there's one experience on offer that take the standard Daintree Rainforest exploration tour and flips things on its head. Jungle Surfing Canopy Tours based out of Cape Tribulation offer guests the chance to zip through this ancient forested area at high speeds with a series of interconnected platforms that provides not only a dose of fun but great views of the surrounding rainforest that put its dense greenery on full display. Hovering at a height of 20 metres above the forest floor is a rare opportunity, and the array of freshwater streams below and colours of the reef in the distance make for some great visual variety. This is an “eco” tour in every sense of the word – it's all conducted with a respect for the environment and aims to educate as much as entertain, with guides offering all the insider commentary on this delicate ecosystem that one could ask for. "This offers guests the chance to zip through this ancient forested area at high speeds with a series of interconnected platforms that provides not only a dose of fun but great views of the surrounding rainforest." It's also highly family-friendly, as little ones can take the simple standard zip line while those looking to kick things up a notch can perform tricks or even go upside-down! Staff here are all very reassuring as they are experienced with handling people who are iffy with heights, and there's never any rush to do the next zip until you're comfortable and ready to proceed. The zip lines from platform to platform come with flying foxes of varying lengths, with the longest span reaching over 75m and making for a substantial thrill. Combine this with the ability to do different zip styles mentioned above and it's far from limited to being a slow and boring glide through the trees should you so wish. Safety is also given top priority at the Jungle Surfing facility, with all the equipment modern and kept up to a high standard while staff consistently ensure that guests are correctly hooked, harnessed and ready to go. Other additional tours are also available that stray away from the zip line formula and allow you to gain an understanding of the nocturnal ecosystem of the Daintree, and the variety of mammals, insects, reptiles and more that make up its inner workings can make for an enthralling guided walk. While it's a fair hike from Port Douglas- a drive of roughly 2 hours will be necessary to reach the reserve it's located on- the unique combination of this part of the Daintree and some active outdoor fun make it a distinctive experience that is typically "Tropical North Qld" all around. While most Great Barrier Reef experiences from Port Douglas are concerned with showcasing the wonders of the reef from the water itself, things take on an entirely new perspective when viewed from the air – the sheer scale of the Reef and its status as the world's largest living organism only truly sink in when you see it stretching out for miles below. Thus, while helicopter flights are a more expensive choice, few other options can match the panorama on display than a flight with Great Barrier Reef Helicopters who offer a variety of different courses showcasing the amazingly vivid colours of both the reef and rainforest from high above. The juxtaposition of greens and blues on display is incredible, and depending on your choice of routes you'll be able to get an even amount of rainforest and reef in the one itinerary. It's truly an awe-inspiring spectacle and you'll want to bring along a proper camera – smartphones simply don't cut it – with plenty of SD card memory space as you'll be taking pictures left, right and centre of coral cays, marine life, coral reefs and much more (although the glare of the sun on the glass can sometimes make getting the perfect shot difficult). Helicopters provide the added benefit of being able to get a close-up look at each of these natural attractions at low altitude, with the pilots adept at hovering in a stable manner to give you a good glimpse at the various animal and plant life beneath the water. It's a good thing that the helicopters are designed with maximum transparency in mind, as passengers will all have access to window seats for an additional unrestricted view. "While helicopter flights are a more expensive choice, few other tour options can match the spectacular panorama on display than a flight with Great Barrier Reef Helicopters." In terms of flight itineraries available, options with Great Barrier Reef Helicopters range from 30 minute trips out to the Daintree Rainforest (an incredible array of World Heritage-protected, ancient tree life with highlights including Mossman Gorge and the expanses of the Alexander Ranges), 40 minute reef-focused trips (providing unmatched views of aquatic spectacles such as the Low Isles and marine-life-filled Batt Reef), and 1 hour combined reef-and-rainforest packages that are the most expensive of the lot but provide the best of both worlds into a single itinerary. Additionally, packages that provide time out on the reef and combine with cruises for the option of heading out in the air and returning via the sea (or vice-versa). It's an entirely efficient and well-run operation that never feels rushed or hasty that has the added benefit of avoiding any of the seasickness of getting out to the reef that cruises can entail. In the end, if you're only going to be making the trip to Port Doulgas once, it's worth biting the bullet to pay for an experience that many often cite as their most unforgettable part of their trip to the region. North Queensland is crocodile country and visitors can learn more about these ancient and mighty predators at Hartley’s Crocodile Adventures. The wildlife park is set amongst the Kuranda National Park just 25 minutes drive from Port Douglas and is your best chance of guaranteed crocodile sightings. Hartley’s Crocodile Adventures has five distinct areas within the park including Hartley’s Lagoon, Cassowary Walk, Wildlife Discovery Trail, the Crocodile Farm and the Gondwana Gateway. There are dozens of wildlife parks in Australia but the point of difference at Hartley’s is the way in which they have made a concerted effort to protect and embrace the natural environment giving visitors the illusion that you are experiencing animals in the wild. If you are going to visit the park then you must visit Hartley’s Lagoon. Here, you will be able to tour the wetlands on a cruise and watch crocodiles, birds and wildlife in the melaleuca habitat. In addition to wildlife presentations, you can take a walk along the Cassowary Walk to see these endangered and quirky birds of the rainforest. "There are dozens of wildlife parks in Australia but the point of difference at Hartley’s is the way in which they have made a concerted effort to protect and embrace the natural environment giving visitors the illusion that you are experiencing animals in the wild." The wildlife park balances entertainment with an educational element and you can even feed, touch or have your photo taken with some of the animals including snakes and baby crocodiles. Given the park’s location within a national park, Hartley’s has a number of self-guided walks through the national park. See plants that were incredibly dinosaur food and indigenous food and medicines important to the local aboriginal tribes. The Gondwana Gateway also takes visitors on a journey through evolution to see how Australia’s unique and endangered animals have adapted to the harsh climate and ever changing tropical climate. Hartley’s Crocodile Adventures is an ideal half day activity for those visitors staying in Cairns or Port Douglas to learn more about the local Australian wildlife, environment and geology of Australia. The park also serves up some tasty meals. Crocodile anyone? If you are not keen on trying this unique delicacy after watching a crocodile feeding presentation then you could always opt for their chicken, fish, steak or vegetarian options at Lilies Restaurant overlooking the wetlands. Hartley’s Crocodile Adventures is open everyday from 8.30am- 5pm except on Christmas Day (December 25). Hot Air Ballooning has a romanticised history as one of the first human flight technologies dating back to 1783 and a symbol of adventure. Fast forward a couple of centuries and you can still find scenic hot air balloon flights operating all over the world over beautiful locations. First time flyers will find it quite remarkable that you can get into a basket and with the help of hot air and gas you can be up in the air floating peacefully above the countryside. The novelty of a hot air balloon flight alone is one reason why you should put it on your must do list. The second reason is because from up above it is far easier to appreciate the beauty of the world down below. And third, in case you needed another reason, dawn happens to be the best and safest time to fly so you will get to experience a tropical North Queensland sunrise floating up in the air in a hot air balloon. Choose between a 30 minute or extended 60 minute flight and watch the world and wildlife wake up to the day below as you float on by. "First time flyers will find it quite remarkable that you can get into a basket and with the help of hot air and gas you can be up in the air floating peacefully above the countryside." Port Douglas hot air balloon flights will transfer you to the Atherton Tablelands, North Queensland’s food bowl where views of rolling green hills and rural countryside will unfold before you as the sun begins to rise. Stand back and watch the balloon inflate before you step inside the balloon and get ready for lift off. In the air, enjoy a cross country balloon chase and keep your eyes peeled for some kangaroos often spotted jumping through the fields. The silence of the balloon in between bursts of hot air makes this experience incredibly serene and a sense of quiet tends to hush over the group that you share this experience with. Scenic flights are also accompanied by helpful commentary throughout the flight but most passengers are too absorbed by the views to really take in much of the commentary. Don’t forget your camera- but if you do there is a giant camera attached to the balloon to capture a group photo of you floating in the air! Hot air balloon flights often include champagne and/or buffet breakfast with hotel transfers from Port Douglas. Passengers should expect an early wake up call at 4am or earlier to get you in the air for that sunrise flight. The centrepiece of every tropical destination is the beach and Four Mile Beach in Port Douglas is stunning. Lined with palm trees and the incredible backdrop of the dividing range and the Daintree Rainforest, every way you look is a feast for the eyes and a great spot for those Instagram holiday shots. The quiet and protected beach is the perfect spot to cool off from the steamy tropical sun or take a scenic stroll along the four miles of hard sand for easy walking. Swimming is suitable here all year round with life guards and netted areas to protect swimmers from dangerous stingers that can be found in the warmer waters during November to May. The beach is centrally located to most resorts and Macrossan St which is the hub of this charming town filled to the brim with boutique shops, restaurants, cafes, ice cream shops and supermarkets for all your essential holiday needs. Another popular walk with amazing views is the walk to Flagstaff Hill Lookout, just a few minutes walk from the centre of Port Douglas. The uphill walk is moderately graded so a medium level of fitness is required but it is also accessible by car or bike. "Discover two of Port Douglas' most popular attractions when you visit Four Mile Beach and Flagstaff Hill Lookout with sweeping postcard worthy views of golden beaches, the Daintree Rainforest and the Coral Sea." The Flagstaff Hill Lookout now includes an extended walking trail with hovering lookouts and sweeping views of the Four Mile Beach and Coral Sea. On a clear, tropical day see the Low Isles, Snapper Island, the Daintree Rainforest all the while walking under a canopy of tropical palm trees and ferns. The walk is the stuff that tropical holiday dreams are made of with luscious greenery, turquoise waters and golden sands. Don’t leave Port Douglas without paying a visit to Four Mile Beach and taking a leisurely stroll along the Flagstaff Hill Walking Trail and Lookout. We recommend an early morning or late afternoon stroll to avoid the sting of the humid, tropical sun. Port Douglas is one of the most popular honeymoon locations in Australia but even if you are not on honeymoon then a twilight sunset sailing cruise is an experience not to be missed. Aquarius Sailing gives you the chance to step aboard their luxurious sailing vessel for a relaxing 90 minute cruise through the Dickson Inlet and out over the Coral Sea. The relaxing sail departing from the Reef Marina is your chance to literally sail off into the sunset. It might sound like a cliché but there is a reason why these twilight sailing cruises are so popular. They live up to the hype. The quiet, calmer waters around Port Douglas are absolutely made for sailing and unless you have your own yacht then sailing is the ultimate tropical holiday experience. "Aquarius Sailing gives you the chance to step aboard their luxurious sailing vessel for a relaxing 90 minute cruise through the Dickson Inlet and out over the Coral Sea." One of the best times to take to the waters is in the late afternoon as the sun starts to set on the day. While on board, you will be offered canapés and glass and ice for the beverage of your choice as this is a BYO vessel. Sit back, relax and watch the sunset over the mountains of the Daintree Rainforest while you sail effortlessly through the waters surrounding Port Douglas. The luxurious sailing vessel is scheduled to depart from Port Douglas in the late evening from 4.45pm and return at 6.15pm for a maximum of 47 guests to keep the experience small and intimate. If you are searching for the best things to do in Port Douglas to make your visit memorable then don’t look past a twilight sunset sailing cruise.